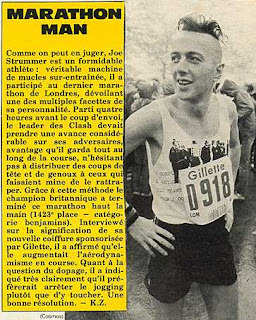 » Did the Clash's Joe Strummer Actually Run the Paris Marathon? Did the Clash's Joe Strummer Actually Run the Paris Marathon? On the eve of the release of Combat Rock, the 1982 album that would become the Clash’s biggest commercial success, tickets for shows the band had booked in England were not selling well. Manager Bernie Rhodes suggested to front man Joe Strummer that he disappear. It was a publicity stunt. Rhodes told him to go to Austin, Texas, and hang out with his friend Joe Ely. Talk about burying the lede. Strummer just up and disappears and, while he’s playing Ambrose Bierce, runs the Paris Marathon? And he just drops that tidbit into the recounting of history in the most nonchalant way? After Strummer says he ran the Paris Marathon, the camera pans over a photograph (seen at the top of the article). It’s of Strummer and Gaby Salter, his girlfriend at the time, presumably after the race. They are both in workout gear — T-shirts and gym shorts. What’s odd, though, is that neither is wearing a bib number, something that a race participant should have. How else to match a runner to his or her time? In Passion Is a Fashion: The Real Story of the Clash, author Pat Gilbert recounts the search for Strummer with a good bit of detail. Strummer’s fake turned real disappearance stunt worked in generating some media attention, but it exacerbated the ticket sales problem. Once fans heard that Stummer was indeed unaccounted for, it was completely reasonable to infer he might not turn up in time for the shows. Nobody was going to buy tickets to not see the Clash. Vinyl tracked down Salter’s brother, who somehow came up with the number of a girl who knew where Strummer could be found in Paris. Vinyl called that girl. She “freaked out” (quotes here are Gilbert’s) and refused to say where Strummer was. So Vinyl contacted a promoter he knew in Paris, who, in turn, got in touch with “a detective friend” who had a reverse phone book, giving them the girl’s address. Within hours Vinyl was standing in front of the girl, who told him to be at certain café at a certain time that evening. Vinyl showed up as told, and in walked Strummer. Maybe. Chris Salewicz’s Redemption Song: The Ballad of Joe Strummer has it reversed, where Vinyl walks in to find Strummer already having a drink at the bar. The important bit is there was a detective somewhere in the chain, although not “hired,” and it was Vinyl who did the bulk of the work in finding Strummer. Is that putting a really fine point on it? Probably. But collectively the two statements in the context of each other both feel embellished; it’s truthiness more than truthfulness. Moreover, it’s not like Strummer wasn’t capable of rewriting history to make himself look better. In Future Is Unwritten, he later describes drummer Topper Headon’s dismissal from the band by saying, “While I was playing hooky everybody had a row, and Topper just decided that he obviously didn’t think I was ever coming back. And he decided to cut out.” That’s pretty much a lie. And a self-serving one. Headon was fired and it was Strummer himself who, at a band meeting, told Headon he was being given the sack. OK, maybe he’s taking the piss out of the reporter, but you don’t not train, then drink 10 beers the previous night, then get up and run 26.2 miles. Not without vomiting and failing to run the 26.2 miles, you don’t. I can prove it. Now, just reading that, your reaction is “not a chance,” right? Marathons are hard. You know how hard? The first person ever to run one died when he finished. That actually doesn’t help much. First, ask anybody who has indeed run a marathon — started it and finished it — and they will know exactly which race they ran. You don’t suffer that much and forget the name. It’s like childbirth (from what I gather at least). There is no “French Marathon.” That’d be like running in NYC and saying, “I ran the American Marathon.” If you actually ran the Paris Marathon, that’s what you would call it. Also, in the picture in question, Strummer is wearing something around his neck. It doesn’t look like much (it’s just on a string, not any kind of ornate ribbon) but could be a finisher’s medal. Salter doesn’t have one. If the picture was taken immediately after the race and they both ran it, wouldn’t she have one as well? Moreover, if she finished last, she’d be the easiest name to find in the list of finishers (or as easy as the winner — one is at the beginning, the other is at the end). But the Paris Marathon doesn’t have a “Gaby Salter” in its official results for 1982. Nor does it have a “Joe Strummer” (nor a “John Mellor,” Strummer’s real name). That makes sense, though. No bib number. No official entry. So neither would be in the official results. Which leaves us where we started. Although it is remarkable for three declarative and completely unambiguous statements made by Salter, the longest of which is six words, to be so unhelpful. Richard Schroeder took the photo in question, the one in Future Is Unwritten. He was hanging out with Strummer in Paris at the time and is someone I’d never seen asked about it, but, in an e-mail exchange, he was able to largely put the issue to rest. Context gives Schroeder’s confirmation epistemic weight, as Strummer is said to have also participated in the London Marathon in 1981 and 1983. 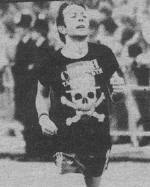 But in 1981, he again had no bib number. For 1983 he was sponsored by The Sun (!) and there are pictures that see him sporting a bib number, looking like an actual participant. Even though his running in 1983 seems certain, the London Marathon itself was little help in being able to confirm his participation or times. They don’t have archived results from before 2003 (and I’ve combed the Internet, joining runner’s forums trying to find complete results magazines from ’81 and ’83, so if you have them, feel free to dig them out and pass them along). And from a marathoning perspective, what you did in 1983 doesn’t have much to do with what you might have done a year earlier. Having run three marathons over a four-year period, I can say that with some confidence. Having run one in a given year wouldn’t have helped at all if I hadn’t trained. And this comes back to the point made earlier: Marathons are really, really hard. It’s an urban myth among joggers: A friend of an ex-girlfriend knows a coworker who has a colleague who, save for maybe like a 10K two weeks out, doesn’t train at all, then runs a marathon, usually finishing somewhere just north of four hours. It’s mind-blowing that Joe Strummer of the Clash is the guy who makes that urban myth not a myth. And does so right down to the time (Schroeder recalled that Strummer’s finishing time was somewhere about four hours). It’s even more mind-blowing when you consider the copious amount of dope that Strummer purportedly smoked, not to mention the likely hangover. At some point you have to shave with Occam’s Razor. Human memory is faulty. That a detail or two doesn’t completely square three decades later makes complete sense. Strummer ran the race. Salter didn’t. Schroeder took a picture of them after. They don’t have bib numbers and they aren’t in the official results because they didn’t officially register. They just turned up to participate. Lochem is historically notable because it marks the end of the Clash as the Clash. Because of his heroin use, Topper would get fired from the band the following weekend, making that his last show. Topper actually sounds fine at Lochem. It’s Mick Jones who was all over the place — out of tune and out of time. “Police and Thieves” is particularly awful as it sounds like he’s trying out some new chord changes for his own amusement. Strummer doesn’t sound too on top of his game either, though. He was probably still sore.